Endometriosis materializes when the endometrium - the tissue that lines the inside of the uterus - sheds, but does not exit a woman's body during her period. Instead, it grows outside of the uterus, spreading to organs and nerves in and around the pelvic region. The resulting pain is so physically and emotionally insufferable that it can mercilessly dominate a woman's life. The average woman with endometriosis is twenty-seven years old before she is diagnosed. It is one of the top three causes of female infertility. The pain it emits can affect a woman's career, social life, relationships, sexual activity, sleep, and diet. It is incurable, but highly treatable. Unfortunately, though, it is rarely treated in a timely manner, if at all, because of misdiagnoses and/or a lack of education among those in the medical community. This book gives hope to everyone connected to endometriosis. That includes every woman and young girl who has it, and the women and men in their lives - the mothers, fathers, husbands, children, and friends - who know something is wrong, but do not know what it is or what to do about it. This book is written at a level that everyone with ties to this disease can relate to and understand, but it is also for doctors with good intentions who lack the knowledge of how to diagnose or treat it. 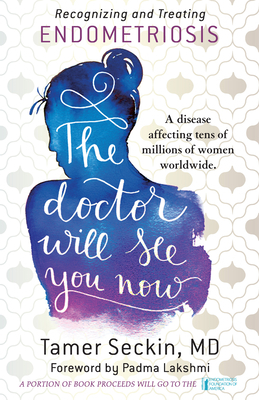 The Doctor Will See You Now is for women determined to let the world know their stories so that every woman with this disease - from the thirteen-year-old girl who is being told that her pain is "part of becoming a woman" to the woman who has been misdiagnosed for decades - knows she is not alone. Yes, her pain is real. No, she is not crazy. Tamer Seckin, MD, is a Board Certified gynecologist and laparoscopic surgeon in private practice in New York City, practicing at North Shore LIJ/Lenox Hill Hospital. He specializes in treating women with endometriosis. He is an internationally known specialist in minimally invasive advanced (laparoscopic) surgery, and is among a very limited number of gynecologic surgeons in the United States who is exclusively committed to the Deep Laparoscopic Excision of endometriosis. In 2009, Dr. Seckin founded the Endometriosis Foundation of America (EFA), the first research and advocacy foundation of its kind organized by a private physician to raise awareness and emphasize the critical value of surgical excision of endometriosis. Under his guidance as Medical Director, the EFA strives to increase disease recognition, provide advocacy, facilitate expert surgical training, and fund landmark endometriosis research.